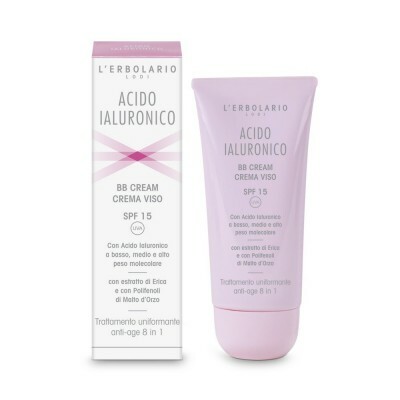 For the many needs and wants of your face, which always loves presenting its most radiant, fresh and compact appearance, Research at L'Erbolario now offers a solution that is not only unique, but also naturally innovative: a formulation that concentrates a good eight cosmetic actions, associating the properties of an extremely effective treatment with those of a product designed specifically to offer a luminous and even complexion! Contained in the recipe at three different levels of the skin, Hyaluronic Acid adds its excellent and equally intense moisturising and age-control action, to help your skin withstand time as much as possible. With a high molecular weight, this ingredient creates an invisible protective film on the surface of your skin, resolutely limiting any water from escaping, while medium molecular weight Hyaluronic Acid passes through the skin barrier, rebalancing the level of moisturisation and thereby tone and elasticity as well. Lastly, with a low molecular weight, it promotes the natural production of the youth protein: Collagen. No longer affected by dryness and premature ageing, your skin also receives the virtues of extract of Heather, the ally of the most fragile skin tissues prone to reddening. But these are only some of the features of this effective BB Cream, also developed to ensure a nourishing and emollient effect, while evening and illuminating your complexion with the action of the antioxidants of Barley Malt Polyphenols. Your facial features will appear smooth and well-defined, and you will have a wonderfully even complexion! Apply to the eye contour area and massage lightly until it is completely absorbed. Low, medium and high molecular weight Hyaluronic Acid, Extract of Heather flowers, Hibiscus Seed Oil, Barley Malt Polyphenols, Gamma Oryzanol, Vitamin E from Soybean.